The Berlin Philharmonic program for the upcoming concert season is outdated – to an extent that you wouldn’t think possible in 2018. Because the next season will be predominantly enacted by men. Women are almost only allowed on the big stage of the Berlin Philharmonic as singers. Because the music scene no longer has Castrati for the high voices, and not everything can be done with Countertenors, the strictly conservative program writers cannot ignore Sopranos. But that is not all: not once does a female conductor stand at the podium of the [Berlin] Philharmonic [in this season]. Also, new music composed by women is almost never played. Of all things, for the Berlin Philharmonic, which makes such a big fuss of their role in youth development, one would expect otherwise, especially since they have had Andrea Zietzschmann as the (female) artistic director for the past eight months. This top operation of German classics is no exception. The Elbphilharmonie (Hamburg) is only a bit more modern and forward looking. We, the audience who are inclined to the classics, are still predominantly entertained by men in the large concert halls. And we can hardly stand it. “There is a need for progress, especially in the area of female conductors and composers” admitted Director Zietzschmann. But it does not appear that anything is happening with them. At least she promises that “in the season after next, female soloists will play a larger role.” Numerically, women remain accessory parts to this day in the top classical music scene, [and even that role is] not guaranteed to them. This discrimination is systematic – it is part of a deeply rooted and rarely acknowledged set of beliefs and practices. It has already been a year and a half since the survey by the German Cultural Council. 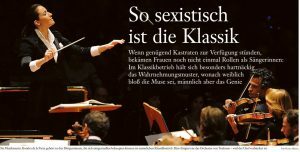 The result of the analysis of the past twenty years showed one thing above all for the world of classical music: it has a sexism problem. And it cannot get it under control. Olaf Zimmermann, President of the Cultural Council, says “patriarchal structures have become deeply entrenched in the pattern of artistic work.” The male genius cult had never been challenged. And it will not be even today. Men are still the geniuses, women still the muses. The artistic leaders have been reassuring the public for years that a lot has already been done, that progress has been made. Statistically, that is false. The classical world had made more progress, more than a hundred years ago. 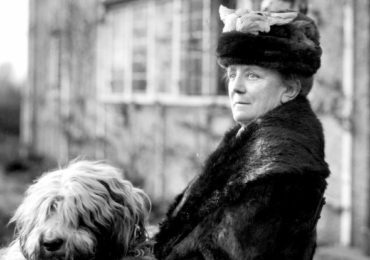 For example, in the 1908-09 season in Vienna, almost 40 percent of the official soloists or chamber musicians were women. It was after that the women disappeared from the main stages. The directors regard the women question as obsolete, at least for soloists, and claim that equality prevails here. But once again, the numbers show this is also not true: one only needs to count the concert programs. And female conductors are not good enough (it is claimed) for the big stages. “Unfortunately, the number of female conductors is much less than the number of male conductors, and so the selection is limited,” said Zietzschmann. This is not plausible: for 25 years, more women have studied singing and instrumental music than men. For 15 years, 40 percent of the conductors and 30 percent of the composer classes have been female. Assuming a normal distribution of talent, the degree programs should produce in percentage terms just as many excellent, mediocre, and bad female musicians as male musicians. But on the biggest stages this is not the case – we see only a very few female superstars like Martha Argerich, Barbara Hannigan, Hélène Grimaud, or Yuja Wang. Natural distribution laws apparently do not apply here. Why? The American neuro-scientist, Vivienne Ming, has been researching this very phenomenon [the prejudice that is discussed in the previous paragraph] for years, though not in the field of fine arts, but in rather in economics. Not without reason does she elevate the issue to the level of human cognition; after all, she has determined that the male or female first name of a start-up founder determines the chances of receiving financing. Our brain, she explains, is lazy when it has to make a decision. When an investor has mostly encountered male engineers, then his brain will resort to this usual assessment of business model and will tend to judge the men’s models positively. The women simply lose the game due to these bad statistics. In other words, people – men and women alike — are prejudiced, and they are most often not aware of it. A whole novel about this cognitive phenomenon was written by American bestselling author Siri Hustvedt, called The Blazing World. It deals with an artistically talented but unsuccessful gallery owner’s wife, who decides (after the death of her husband) to restart her career as an artist with the help of three men. Behind their masks, the perception of her art changes 180 degrees. There is, Hustvedt said, a perceptual reality: art is assessed very differently depending on whether a male or female name stands by it. And she knows that countless studies have long since proven that. This perceptual reality is not different in music – it is just that it simply not believed. Maybe they should advertise a highly paid composer competition, in which the submissions are anonymous. Like the curtain for auditions that was introduced in America to eliminate the problem of skin color. The trick revealed something amazing — it brought more women into the orchestra and made the body of sound of the orchestra even better. Not because the women played better, but because fundamental pool of talent was increased greatly. One cannot measure quality the way that distance is, in meters, says the Viennese music historian, Melanie Unseld. A Beethoven Symphony does not have a value of 80 and one by Mozart 79 or 81. Does a Beat Furrer compose better than the grand Sofia Gubaidulina? Unseld has always addressed these issues of women in music and how they are perceived. “There are mechanisms supporting the belief that the question of quality is gender neutral,” she says. Because it is based on an aesthetic criteria that has been developed for centuries, in (thought-)structures in which men call all the shots. “What pieces does a female piano student get to learn?” one can ask. Only on rare occasions does she learn [music by] Fanny Hensel. And then what will she then learn at the conservatory? Gender obscures the perception of quality in such a way that more than a few people have adopted the assumption that women cannot conduct. That is the way it has been for decades. 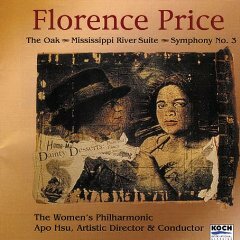 What deficits have not been attributed to all female musicians? For example, intonation difficulties and rhythmic insecurity – a death sentence in serious music; or shortcoming in contrapuntal technique, which is a basic prerequisite for composing. In the meantime, the professional niveau is out of reach: women could not conduct male music like that of Bruckner or Stravinsky; or they exude too much sexual energy at the podium – the musicians who had their concentration impaired would, of course, play poorly. It goes without any explanation: women at the podium? “Just not my cup of tea,” said acclaimed Latvian conductor Mariss Jansons a few months ago. Outrage followed, and the poor guy, certainly not a misogynist, backpedaled meekly, then let himself be carried to a very true statement: he just comes from another time. Right – Jansons comes from the world of yesterday – at least in the issue of women. Only if the men decide to follow suit with Tonhallen boss Ilona Schmiel: although this coming season offers their audience no female conductor, but certainly comparatively strong female soloists. “The head conductors must, on their part, insist on finding outstanding female conductors and engaging them.” After all, it is also crucial to “who will be discovered and pushed by whom.” Alexander Steinbeis, director of the German Symphony Orchestra Berlin for more than a decade, which shares the Scharoun building with the Berlin Philharmonic, will feature three female conductors in addition to several female soloists on the big stage. “I would like to have more,” he says, especially those who have an excellent reputation and a lot of experience on the big stages. But how are there ever going to be more, if so few famous orchestras are willing to trust them for an evening?” Here is the circular reasoning of the problem [“the cat bites its tail,” is the German expression], that he understands. Meanwhile, the Minister of State for Culture, Monika Grütters, has initiated another mentoring program for young women in art and culture. The Siemens Foundation now wants to look after women more, she says, and Jansons is now all about young female conductors. The crux of it is: aid support programs nurture the old patterns of perception that women still need help, because they are not good enough. 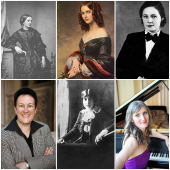 It does not lie with the quality of the female musicians, but that the men in the classical music industry set still the tone. In 2018, women will belong on the conductor’s stand, and they will be rewarded. Their music deserves to be played. Not promotion, but recognition is the solution – it could be that easy.